The main purpose of each ESWI is to establish in each OR field a network of outstanding people who will continue to work together in the future. The basic idea is that around 25 early stage researchers, who are either PhD students or who have less than two years research experience since completing a PhD can meet for about two weeks. All participants will have an unpublished paper within the theme announced, and will present their material, discuss it with others and with a handful of specially invited senior experts in the field, and finally prepare a paper to be considered for inclusion in a feature issue of an OR publication. Up to two ESWI may be organized every year. Each ESWI desirably covers a different theme so that as many early stage scientists as possible will have the opportunity to participate once in their career. The duration of an ESWI is normally between 10 and 14 days. The official language is English. Every participant gives a well-prepared presentation of her/his paper as a starting point for discussion. Invited experts' lectures can be included in the program, as well as seminars and other research activities conducted by the Scientific Committee. The organizers are encouraged to prepare a special or feature issue of an OR publication, with a peer-reviewed evaluation process, with a selection of papers prepared and discussed in the ESWI. The announcement of a EWSI and the call for applications will be disseminated to all EURO member societies and made available on the EURO web site. Disregarding the senior experts, no one else can participate more than once in his or her lifetime. they are early stage researchers, who are either PhD students or who have less than two years research experience since completing a PhD can meet for about two weeks. they have a single-authored or co-authored paper in the selected field, which has not yet been published, nor accepted for publication. they are from a EURO member society country, or studying in a EURO member society country. To apply to the ESWI, eligible candidates should submit their curriculum vitae together with their paper to their Scientific Committee of the ESWI. The Scientific Committee selects and ranks (in the case of more than one accepted from the same country) the candidates and passes their applications to the National Societies for funding decision. Additionally, up to two candidates can be appointed by IFORS, according to the EURO and IFORS exchange for ESWIs (see guidelines below). The deadline for admission applications is 4 months before the ESWI starts. If the travel costs of the participants are not covered by their National Societies, they should be covered by the participants themselves. All living costs (accommodation, meals, and travel within school activities) should be supported by the ESWI. Define the theme: Outline of the theme on the application form is provided. Nominate an Organizing Committee: The committee should consist of local people approved by the National OR Society and is responsible for all the organizational matters of the ESWI. The Committee must include at least two prominent senior scientists in the field of the ESWI who will be able to stay for the full duration of the Institute. The role of these scientists is to contribute to the discussions about the work of the participants, conduct workshops and assist the participants in improving their papers. Fix the dates: The duration of the ESWI will be between 10 and 14 days, in the summer or winter periods, with accommodation usually on a University campus, preferentially starting with a get-together activity in order to develop friendly links between the participants. Find a location: The chosen location has to include facilities for the scientific work, as a conference room, for accommodation and good alternatives for social activities. EURO considers the social activity (dining and playing together) to be very important for the success of the ESWI, because it is through these activities that friendships develop. EURO financial support: EURO provides in advance a financial support to cover part of the costs of the organization, accommodation and social activities. Costs above this will have to be covered by the organizing society and sponsors. The additional funds will be raised by the organizers. Public institutions and private firms should be approached. Currently EURO provides a maximum of 25,000 EUR to fund the ESWI. The organizers receive 5,000 EUR as a lump sum. Further, the financial support of each selected participant, coming from EURO member countries or appointed by IFORS, is of 800 EUR. Other participants fulfilling the eligibility rules may be accepted in the ESWI but will not be supported by EURO. Raising additional funds: The organizers should try to obtain as much external funding as possible, to increase the number of invited speakers and social activities. Government, institutions, foundations, firms, societies, all kind of possible sponsors could be approached. The sojourn (accommodation, meals, social activities, scientific programs) is offered to the participants. Participant's travel expenses to the host country are at their own costs. EURO strongly encourages National OR Societies to cover travel expenses of their participants. Submission of proposal: at least 18 months before the proposed date for the ESWI. Call for participation and circulation of information among OR Societies: 14 months before the ESWI. Selection of Candidates by Scientific Committee and communication to the National OR Societies: 3 months before ESWI. Submission of paper final versions for publication in the eventual special/feature issue: 4 months after the end of the ESWI. Submission of a Final Report on the ESWI by the Chair of the Committee, to the Executive Committee of EURO: 4 months after the end of the ESWI. A website for the ESWI should be set-up and used as the main source of information dissemination. Large size and/or reduced size posters announcing the ESWI may also be prepared. The announcement should include the definition of the theme and other relevant information, and should be sent to the editors of the EURO and IFORS websites, as well as to all National Society EURO representatives, etc. Address it directly to potential interested persons in Universities and Research Centers, and to prominent persons working in the field of the Theme in Europe. Each participant has to submit a paper (possibly co-authored). Only the best applications will be selected. Nobody can participate in more than one ESWI. A good balance among countries should be sought. People of the host country, or people being in the host country at the time of the Institute, may be invited. Try to get a good balance between invited speakers tutorials, or other training activities, and students' presentations. Avoid invited speakers requesting too much travel expenses. It is recommended to give free accommodation and board to the speakers and, if possible, a lump sum to cover their travel expenses. Well in advance select an OR publication with a peer-review evaluation process, contact the editor and negotiate with him/her the publication of a special/feature issue. Run the refereeing process. This special/feature issue should be completed no later than 12 months after the Institute. Believing that OR professionals in the early stage of their careers (within 2 years since acquiring their PhDs) should be supported, EURO and IFORS agreed to exchange early stage researchers in their Institutes. The aim of this cooperation is to reinforce the relations between EURO and IFORS. One early stage European researcher will participate in the program at IFORS institutes in a developing country. When called for, EURO or IFORS may opt to send a second candidate to the Institute. ESWI is an instrument EURO has established for the encouragement of good social and working relationships between promising early stage OR scientists. The official language is English. According to the Exchange Program, IFORS will send one or two researchers, preferably from a developing country, to ESWI. For the IFORS-sponsored participants, IFORS will cover travel expenses while local costs will be assumed by EURO. IFORS is also responsible for selecting candidates who must meet all the ESWI criteria, specifically that the applicant is an early stage researcher who can present an unpublished paper along the ESWI theme. Each ESWI is responsible for sending a call for ESWI participants to the IFORS Office. IFORS will issue a call for candidates for the Exchange program detailing, among other things, that the applicant must have a good knowledge of English. IFORS will require (1) a complete CV, (2) a paper proposal (complete text or a 3-5 page extended abstract), and (3) a letter of recommendation from one referee (preferably the thesis advisor or head of department). The IFORS Vice-President [EURO] is responsible for evaluating the candidates according to the procedure given below. The candidates ranked first, and possibly second, will be selected to participate in the Institute. The IFORS Vice-President [EURO] will inform the selected candidates, as well as IFORS and the Chair of the Scientific Committee, of the ESWI about the final decision. All selected candidates must send a report to the IFORS Vice-President [EURO] no later than one month after the termination of the ESWI. The report must summarize the activities of the candidates in the ESWI and indicate the benefit obtained from his/her participation. IFORS Institutes take place in developing countries. Their main purpose is the interaction and interchange of ideas between OR seniors and early stage scholars. Each Institute must comprise at a minimum a full stream of English speaking presentations. According to the Exchange Program EURO will send one or two early stage researchers from EURO to the Institute. Travel expenses will be covered by EURO while local expenses will be covered by IFORS. 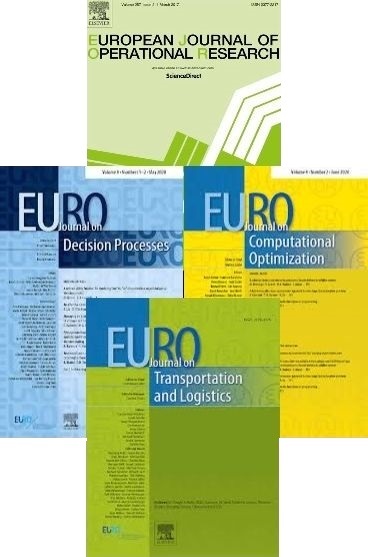 EURO is responsible for selecting one or two candidates from EURO countries who must meet all the Institute's criteria (early stage researchers, presentation of an unpublished paper in the relevant topic). IFORS is responsible for sending the IFORS Vice-President [EURO] a call for candidates for IFORS Institutes, which will be distributed among EURO member Societies. To apply, candidates with a good knowledge of English should respond to the call by sending to their National OR Society their application including (1) a complete CV and (2) a paper proposal (complete text or a 3-5 page extended abstract). Each EURO member Society is responsible for selecting one early stage researcher from the corresponding country and forwarding his/her candidature to the IFORS Vice-President [EURO]. The IFORS Vice-President [EURO] is responsible for selecting one or two candidates among the ones selected by the national societies, according to the procedure given below. The IFORS Vice-President [EURO] will inform the selected candidates as well as IFORS, the Chair of the Scientific Committee of the IFORS Institute, and the involved national societies about the final decision. All selected candidates must send a report to the IFORS Vice-President [EURO] no later than one month after the termination of the IFORS Institute. The report must summarize the activities of the candidates in the IFORS Institute and indicate the benefit obtained from his/her participation. The candidate with the higher score is automatically selected. When appropriate, IFORS and EURO may opt to also award the candidate ranked second.